1970’s/80’s exploitation cinema has been making a comeback for many years now, ever since Grindhouse, we have had countless films attempting to recreate that style. Mandy is the latest attempt at a throwback. It comes from Beyond the Black Rainbow director Panos Cosmatos, son of Rambo: First Blood Part 2’s George P. Cosmatos, so you can understand why he would set out to make something with an 80’s flavour. The result is a film that is here to dethrone every other film in this sub-genre and take it’s place as a modern classic. In 1983, Red (Nicolas Cage) and Mandy Bloom (Andrea Risborough) live in the forest in California. Cult leader Jeremiah Sands (Linus Roache) sees Mandy one day and asks his followers to kidnap her. Red and Mandy’s tranquil life is shattered and Red must go on a path of revenge against her kidnappers. What’s interesting about Mandy is that, on paper, the story sounds simple and cliched. However, Cosmotos takes this plot and makes it so much richer on an emotional and storytelling level. The film takes the time to establish the main relationship between Red and Mandy; enough to where you are invested in them as characters. The slow pacing works in the film’s favour because it uses that to characterise everyone and build an atmosphere, never feeling indulgent and repeatedly packing a serious emotional gut-punch. To go into full detail on the film’s emotional core and the themes that Cosmotos tries to go for would spoil the experience, but you will be both feeling something about and chewing over this film for a long time afterwards. This story would not be complete without great performances to back it up. Andrea Risborough as the titular character is excellent, as she brings a lot of humanity and innocence to the strange atmosphere. Linus Roache is one of the creepiest villains I have seen in years, as a cult leader that embodies a Charles Manson-esque egotistical cult leader far better than Chris Hemsworth’s recent attempt in Bad Times at the El Royale. His mere presence is terrifying and he has several scenes that really get under your skin. But Nicolas Cage delivers the performance of his career. Whilst he has been relegated to DTV films for many years, this performance is so good that it might make him an Oscar contender again. In the first half, Cage barely speaks, yet he is totally convincing as a normal caring husband. But once the second half roles around, his grief, anger and madness are palpable and fully comprehensible. The typical Nic Cage freak-out is no longer funny in this film; it’s gut wrenching and horrific. But Cage’s crazy persona is also played up for dark humour that prevents the tone from feeling too dour, especially during the fight scenes. Visually, Mandy is mesmerising. Whilst one might dismiss it as just a knock-off of Nicolas Winding Refn’s neon blood-drenched style, the influence of 80’s Heavy Metal, fantasy cinema and music videos set it apart and create something entirely unique. You could cut the atmosphere with a knife, as every shot is so well planned and so beautiful that they could each be framed as a painting. On top of that, the fight scenes are entertaining and perfectly choreographed, the gore effects are amazing and the music by the late Johann Johannsson is entrancing. 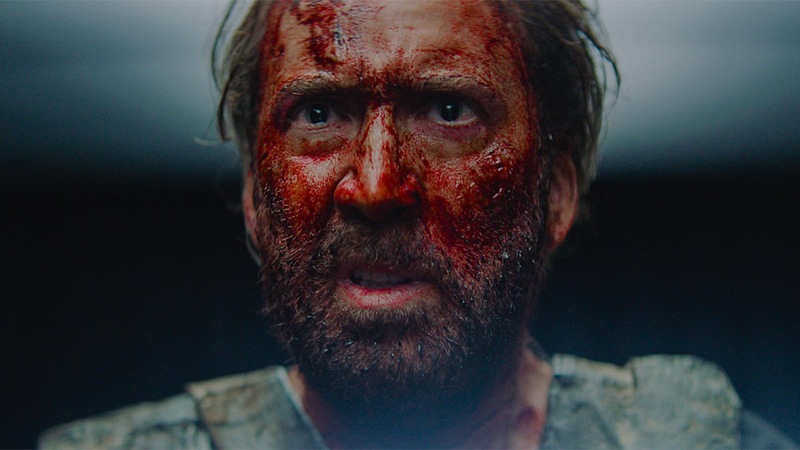 Mandy is a masterful art film, a brilliant revenge thriller and a deep emotional drama all at once. As far as Grindhouse/B-movie tributes go, it is probably the best of all time. This is the kind of film that will probably inspire future filmmakers, which is something I do not say very often.